Saturday also features the S2K Challenge, Nissan Challenge, Bimmer Challenge, 86Cup, and the Maxxis Cup Supermiata and INEX races. Sunday also features the Maxxis Cup Supermiata and INEX races. Timing AMB Timing and Transponders are available. CANCELLATIONS/NO-SHOWS: It is much more difficult than usual for us to provide refunds/credits for cancellations/no-shows inside of 10 days for Sonoma Raceway events. As always, we will do our best, but please be aware of our greater constraints for this event. SOUND LIMITS: The sound limit at Sonoma Raceway is 103db measured at 50ft. Sonoma Raceway will randomly spot check. One warning will be given to the driver of any vehicle that measures between 103db and 106db. After this initial warning, if the vehicle measures over 103db again it will not be allowed to participate further. Any vehicle measuring over 106db will be immediately disqualified from participation. While these sound restrictions won't affect most cars, they may affect some. Be aware that we do not provide refunds or credits for cars that do not make sound. Also note that race car engines are not allowed to be turned on until 8am and must be shut off after 6pm. This does not apply to cars with acceptable levels of sound. SCHEDULE: A full schedule will be emailed out a day or two before the event and provided at registration when you check-in. Please show up at the track no later than 7:00am and go straight to registration to check in. Please check in BEFORE unloading or working on your car. Check-in will close at 7:40 and the Advanced Group Drivers' Meeting will begin as early as 7:40am. The Drivers Meeting is mandatory for all drivers - unless you have received clearance from Speed Ventures to show up late. 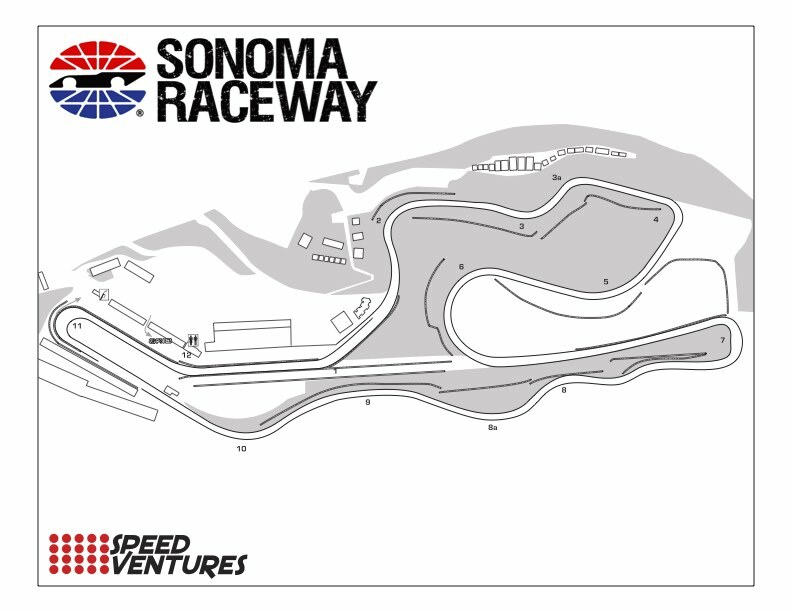 LOCATION, UNLOADING, CAMPING: Sonoma Raceway is located at 29355 Arnold Dr. Sonoma, California 95476. The gates are open at 6am and close at 10pm. You may drop off your car/trailer after 5pm Friday, up until 10pm. Dry camping (no hook ups) is allowed, but if you leave the facility and try to return after 10pm you will not be able to get back in. GARAGES are available for rent, and each garage can fit two cars end to end. Please contact us asap if you didn't sign up for a garage and would like one added to your registration. FUEL is normally available at the track. LODGING: There are several hotels very nearby in Novato. Book early as they tend to fill up in the Summer. CAR NUMBERS: You must have car numbers, at least 8" tall, located on both sides and either the front or back of your vehicle. This is mandatory for all drivers. You can make up a 3-digit number - we will notify you if it is in use by another driver at the track. TOW HOOKS: are required. If you do not have a tow hook on your car, please figure out a tow point we can use to hook on to in order to pull you off track in the event of a mechanical problem. You are responsible for establishing a tow point - Speed Ventures will not be responsible for any damage done to your car.